Thanks to a study by business research firm Expert Market, we can now quantify the adage, “work hard, play hard,” and point workers in the right direction to find cities where people earn more but work less. The study looked at the average pay, working hours and paid vacation taken by workers in 69 cities around the world to reveal what the study calls the “millennial Holy Grail.” The study cross-references data from average monthly salary to annual working hours and paid holiday taken; the results were analyzed to list, in order, the cities that offer the best reward for the least amount of work. Expert Market states that the current work atmosphere is influenced by millennials increasingly rejecting the traditional 9 to 5 jobs “in pursuit of a healthier work-life balance and wanderlust.” Leading the pack, Luxembourg was ranked No. 1 if you want a high paycheck paired with plenty of time off. The study found that the average worker makes $4,291 monthly for 33 hours in the office per week. Luxembourg isn’t the only European city that ranks high on the list. 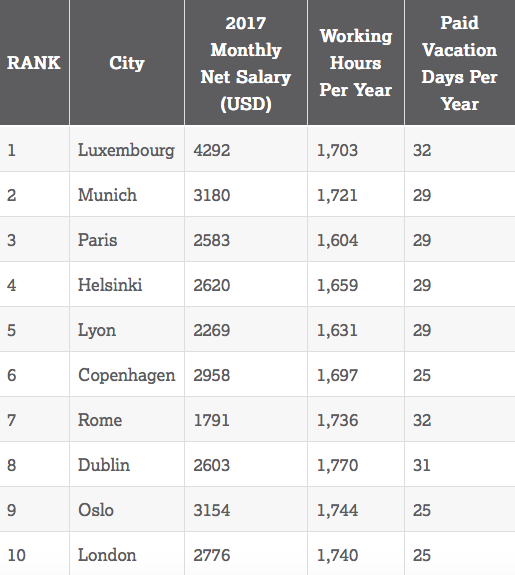 In fact, every city in the top 10 is in Europe, which makes it the best place to earn more for working less. New York doesn’t even crack the top 10 — while the salary is impressive in the Big Apple, workers there put in a lot of hours. 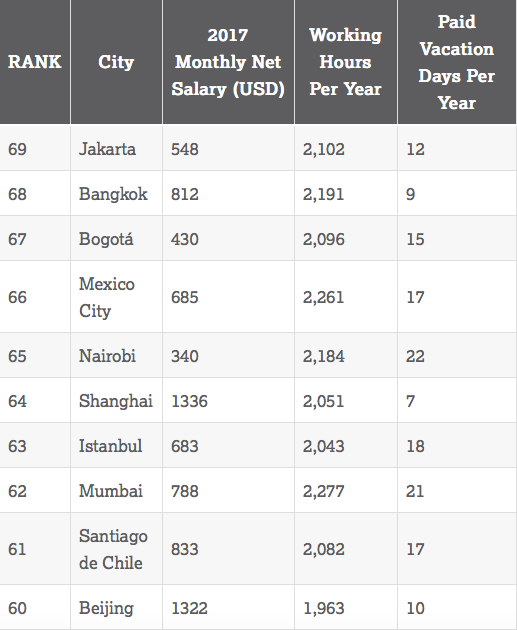 As far as the other end of the spectrum, the worst work-life balance can overwhelmingly be found in Asian cities with Beijing, Shanghai, Bangkok and Jakarta all in the bottom 10. Shanghai and Beijing offer a total of seven and 10 days off, respectively. The US did not fare well in the study, either, with no cities in the top ten spot. Chicago was the worst American city to move to. Windy City workers make a respectable $3,622 every month, but they only take off 14 days from work every year.